Friends vs Buckingham B.A. at Chesham B.C. The day started as it meant to continue, very hot, a few clouds and high humidity. We were met by a very nice gentleman in the car park who showed us where to leave the cars. He had spent the morning preparing the green, which looked and played beautifully. We were greeted with cups of tea on arrival. Very welcome when you have travelled a long way. There were players from eleven counties playing for the Friends. We had an excellent buffet lunch prepared by Janet and her helpers. Including some wonderful, home-made, cup-cakes. Norman (the greenkeeper and car park attendant) was now dressed in his blazer and chain of office as the club President. He handed over the green and then rushed off and changed as he was to become our sub (one of our players did not show). A man of many talents. The game was full of fun and laughter could be heard on all the rinks. We played a full game and when it finished we were all ready to go inside for a sit down and a cooling off. We sat down to a five star meal, once again prepared by Janet and her helpers. Presents were exchanged, top rinks given prizes and amusing speeches given by both sides. 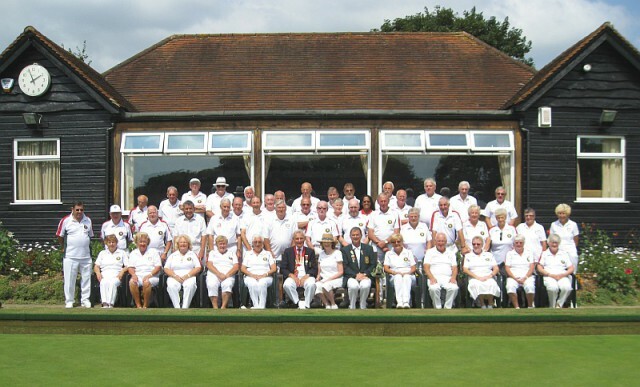 So ended a wonderful day, celebrating the centenary of the Buckinghamshire Bowls Association, with lovely people at a superb venue, which was greatly enjoyed by all. What a shame we lost by 5 shots.